Is it just me, or for some reason is it harder to work out in the summer? I think the warm weather hits and not only does the sun and summer heat zap my energy, but I get bored with my usual workouts, and just want to be outside soaking up the sun instead of slaving away at the gym! Well this last week, I found a great workout you can do from home, or even outside like I did if you’re dying to get in as much time in the sun while you can! 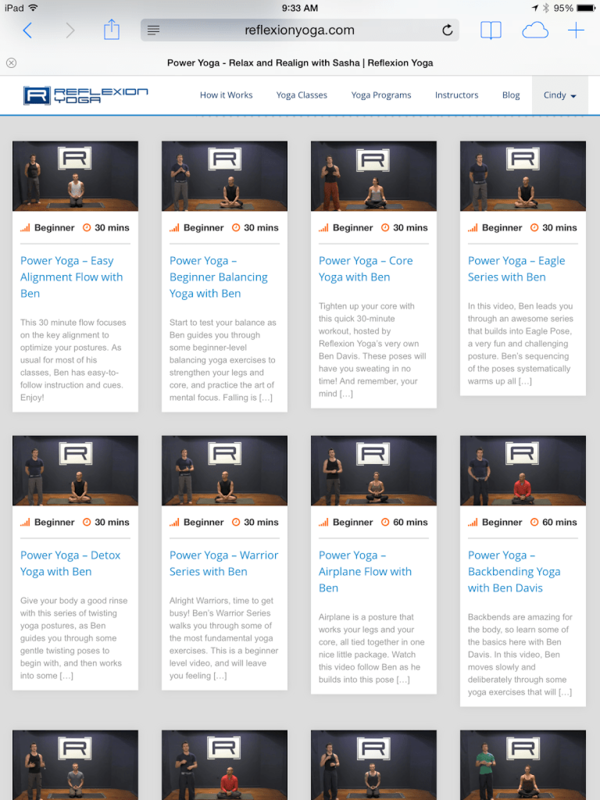 ReflexionYoga.com offers a HUGE variety of yoga workouts that will keep you busy all year long! New to yoga? You can find lots of great beginner workouts here to help you get started on your path to feeling better, looking better, and having much more energy and inner peace! I started working out only about 10 years ago, and nothing about working out excited me. I hate to sweat, I hate running, you name it, I wasn’t into it. Yoga was the only thing that got me motivated enough to try to do something for my self everyday. I started doing yoga daily for about 30-40 minutes, and it was the only workout I would do for about the first couple of years. It was the one workout I enjoyed, and I loved that I saw benefits from as well. I was in the process of losing weight by eating healthier and practicing yoga regularly. Yoga helped me find my inner peace and calm, as well as a tighter, more toned body! Years later, I do not do yoga as often as I would like to, and when my workouts were starting to come to a loll this summer, I loved that Reflexion Yoga helped to bring me back to the one form of exercise I an always count on to keep me motivated. 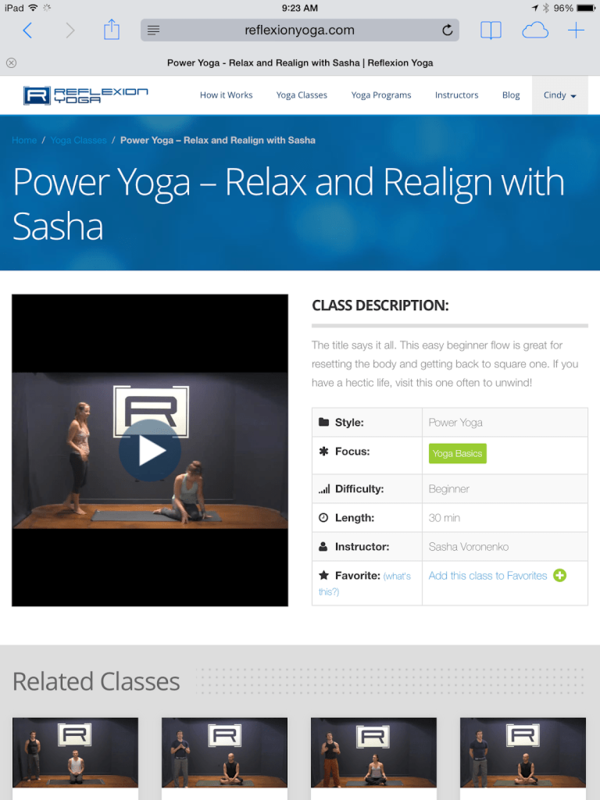 ReflexionYoga.com is a great workout program for anyone who enjoys yoga or who is looking to get into it. It’s super easy to maneuver around the website too, taking only a matter of minutes to find your perfect workout for the day. The variety of workouts you will find are absolutely amazing too! I tried everything from power yoga for 60 minutes, to a time-of-the-month yoga. Yep you heard that right, a nice relaxing yoga great for getting you through the dreaded low energy, and dreadful PMS symptoms. I also tried out an after work stretching yoga too, which I absolutely loved. Love the balancing poses? You can find special 20-30 minutes classes just for practicing your balance though fun, challenging poses. You can even choose from a selection of classes used with weights, so you can get a great muscle workout that day by using yoga AND some added weight! You absolutely won’t get bored with this program either, as there are so many classes to choose from and more and more are being added all the time! Even though I’m an intermediate Yogi, I found a lot of the beginner classes to be every bit as challenging, especially when doing power yoga. Yet they are simple and the instructors give wonderful enough instruction, it makes it easy for the novice to pick it up and dive right into the workout! What I loved most about this program, is that I could do it from my own home. The first few days it was rainy so I grabbed my mat and did a program or two in my living room. When the rain went away, I found some shade, set up my mat, and practiced yoga outside. I have actually never done this before but found it incredibly relaxing, especially for the cool down. I could relax and listen to the birds chirping, and breathe in the fresh air. It really was the ultimate, perfect summer work out for me. Not sure you’ll like yoga? You can try out a ReflexionYoga trial for free to see if it’s something that will work for you. For all the different ranges from beginning to the more experienced yogi, and with the huge variety of classes, this really is the perfect program for everyone. Not sure how to add yoga into your daily routine, or which routines are best for you? Try out one of their 8 week yoga programs which help guide you into more intense programs as you build up some muscle and stamina over the weeks. I absolutely adore this yoga workout program and am so thrilled I got to try it out. I’ve found my love for yoga again and love that I can do it right in the comfort of home. I get so bored with workout dvd’s this is the perfect way to keep things interesting for me, keep my body guessing, and help me find a great workout every single day, that leaves me feeling better about myself and more energized. * I was given a trial of this product for the purpose of review. However, all thoughts and opinions expressed in this post are solely my own. I only share reviews with my readers, I feel will be beneficial or informative to them in some way. yoga is the best! I love it, I do it while I am pregnant too! Useful information for me, thank you! Perfect for relaxing but especially for pregnant women, many of my friends practice it. I’d like to start sooner or later!